A game called Glitch Strikers was created for those who love 8 bit video games. The story began with a bighead looking for heroes to join his game (or mission). One target was a female ninja. She was well taught and ran fast. Yet she couldn't escape from his sight. She surrendered and followed his lead. Kunoichi: Yes, I'm your slave. I obey, my Lord. Do you appreciate this game? Please vote for it in Steam Greenlight. Today's breaking news must say "Donald Tsang: Hong Kong former leader sentenced to 20 months". Someone says he was greedy but someone says his crime was unavoidable. What an excuse. When a cat burglar who wore black pantyhose and black veil said her burglary was avoidable, say due to her poverty, what should a policeman respond? Policeman: I shot you. Sorry, it's avoidable. Screw Piledriver is a famous move of some wrestlers. The move is powerful and fatal to Kunoichi The wrestler attempts to grab a Kunoichi; if successful, he holds her upside down by the waist, then leaps into the air in a sitting position with her head between his legs. Spinning rapidly, he slams her headfirst into the ground for massive damage. 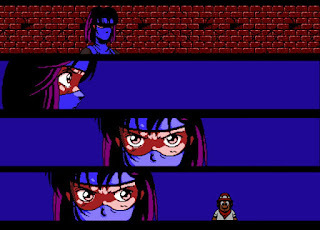 The only way for the female ninja to escape is to absorb all of the enemy's power before heading to the ground. How probably can she survive? Ninety nine point nine nine nine ... or more to death. She wore in white in daytime, while she dressed up with black bodysuit and black veil at night. She was a female assassin. At last she was arrested by a security guard and locked up to prepare for being tortured.